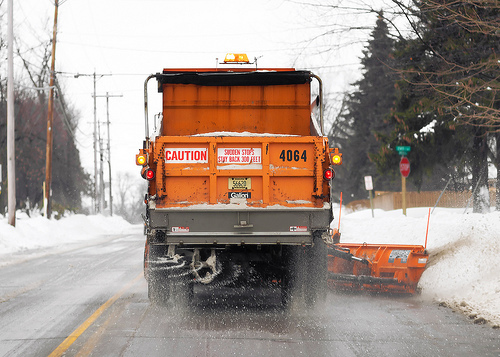 Road salts are usually defined as the chloride salts of sodium, calcium, magnesium, and potassium, which are the four most common chemicals used for winter maintenance. Every winter, more than 5 million tonnes of road salt are applied to roads, parking lots, and sidewalks across Canada¹. Road salt is used to control snow and ice, making winter driving safer and more efficient. It is used extensively in Canada because it is effective, relatively easy to transport and use, and low in cost. The environmental impact of road salt use in Canada has been documented in several studies, including a comprehensive five-year scientific assessment completed in 2001 by Environment Canada. This assessment concluded that road salt is entering the environment in quantities that may pose immediate or long term environmental risks. Elevated concentrations of chloride salts may cause adverse effects to aquatic life, terrestrial vegetation, soil structure, and drinking water. The economic impacts of road salt use include corrosion damage to roads, bridges, parking garages, and underground utilities, as well as the costs of implementing corrosion protection measures. Salt corrosion also affects motor vehicles, especially brake linings, frames, and bumpers. When these factors are fully accounted for, the costs of road salt use become considerably larger. Over the last decade, there have been significant advances in winter maintenance technology and practice. From the development of low chloride alternatives to road salt, to improved equipment and application techniques, to advances in our ability to monitor weather and pavement conditions, winter maintenance practitioners now possess more tools to safely and effectively control snow and ice using less road salt. Select a project on the right side bar for more information about STEP’s work in road salt management. ¹ Environment Canada. 2004. Best Management Practices for Salt Use on Private Roads, Parking Lots and Sidewalks, page 1.